This company has done a great job with building out this system. It is easy to use and the customer service is great! Newfies Dialer is a good application that meet the simple need for voicebroadcast/sms. The clients appreciate the simplicity and easy use; the features meet objectives needed. We have been using this dialer for well over a year, I have lots of 100’s of hours researching and testing other dialers, Newfiers is by far the best dialer for the money, hands down! We have already turned other small marketing partners onto this dialer and recommend to anyone looking to control their cash flow with phone calls. While DialerAI does not offer a complete call center software platform, they offer the necessary tools to enable your agents to boost their productivity and place even more calls within the same amount of time. DialerAI offers an extensive list of features and support options to compliment their solutions. If your business is searching for the right auto dialer to supercharge outbound campaigns but does not need or want an entirely new call center platform, then DialerAI offers the perfect solution to sit alongside your existing VoIP service. In fact, DialerAI offers what they call “Bring Your Own VoIP Provider,” enabling businesses to continue with their existing phone service. For those that need a telephony provider, DialerAI will help point your business in the right direction. But without the need to offer standard call center features, DialerAI is able to focus directly on their dialing software, as well as other solutions that work alongside these powerful dialers. Whether your business simply needs a basic auto dialer, or a more advanced predictive dialer, DialerAI offers both options with customizable plans based on calling limits and the number of concurrent calls supported. While the solution seems costly, DialerAI does not charge per agent or seat, but instead places limits on the number of calls and SMS messages your business can send. 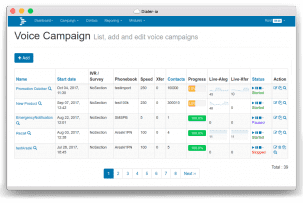 DialerAI points out that their solutions aren’t only designed for outbound marketing and can even be used for reverse emergency notification services, outbound call conferencing, political polling, appointment reminders, and marketing research. Powerful features like an auto-retry function, after-the-beep message drop, and voice & SMS broadcasting ensures that your business has the right features to get your message out there and connect with clients and leads. Their post-call survey software enables your business to gain even more information on their service and customer satisfaction. DialerAI also manages to include the critical DNC compliance in their solution to ensure your business doesn’t run into any legal issues, however being based in Europe there does not seem to be FCC or FTC compliance built in directly. However, being based in Europe enables DialerAI to offer their service internationally, a great plus for any organization that has offices overseas and requires that international reach. Despite their location, DialerAI does include USA Time Zone Support. Another unique aspect about DialerAI solution is white labeling support. The platform is not only designed for end users, but resellers as well to create their own platform based off of DialerAI’s solutions. Overall, DialerAI represents a focused provider, honing in closely on powerful dialer solutions and their complimentary tools. What Do You Think of dialerAI?